Although many people know the Loire Valley for its wine and wine cave tours, fewer know just how vast and varied the underground world is here. The local tuffeau stone (a type of limestone) has been mined for centuries as a construction material. 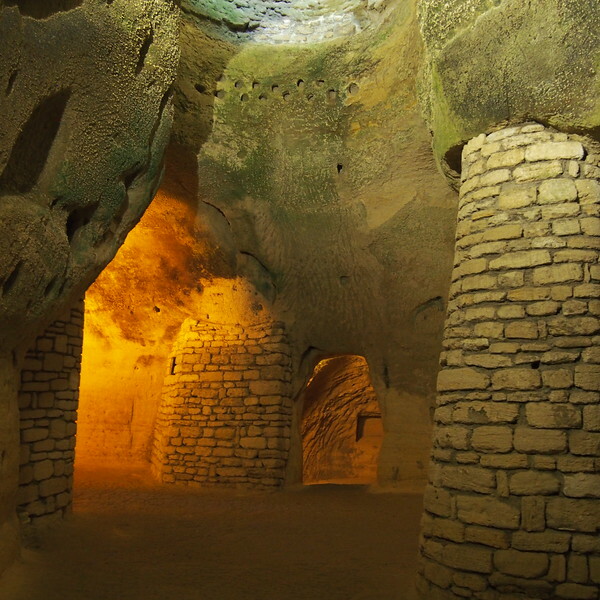 This created artificial caves underground or along the hillside, many of which were further excavated and turned into homes. These homes ranged from the humble abode of a poor farmer who may have shared the rooms with some of his livestock to the elegant cliff-side chateau of a queen. Cave house in Forges, France. 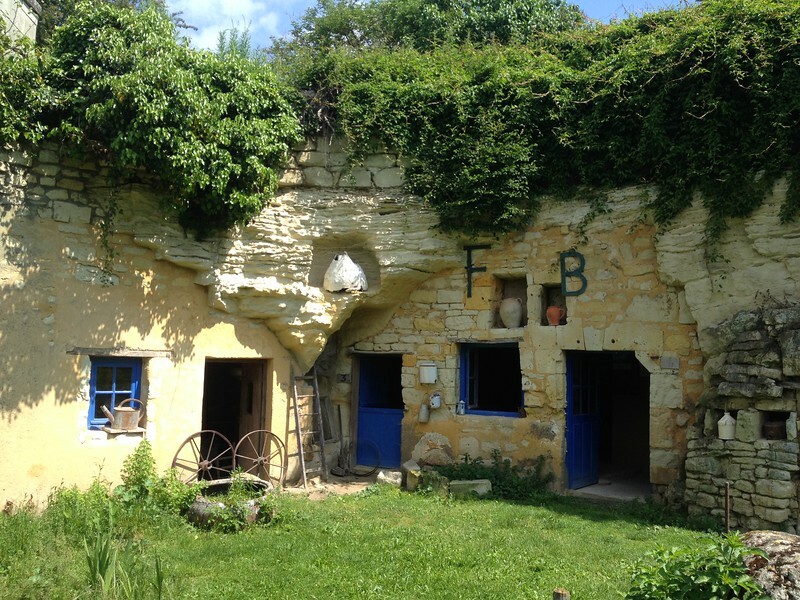 Les Maisons de Troglodytes is a small farm in the village of Forges that was inhabited up until the end of the 19th century. In 1979, Bernard Foyer bought the abandoned ruin and opened it to the public as a tourist attraction. I don’t know if he made many improvements to the property other than putting some old farm tools on display. Some of the rooms are in very rough condition. The current owners purchased it in 2013 and have been hard at work ever since renovating it while living in the property and caring for an assortment of chickens and even a peacock. 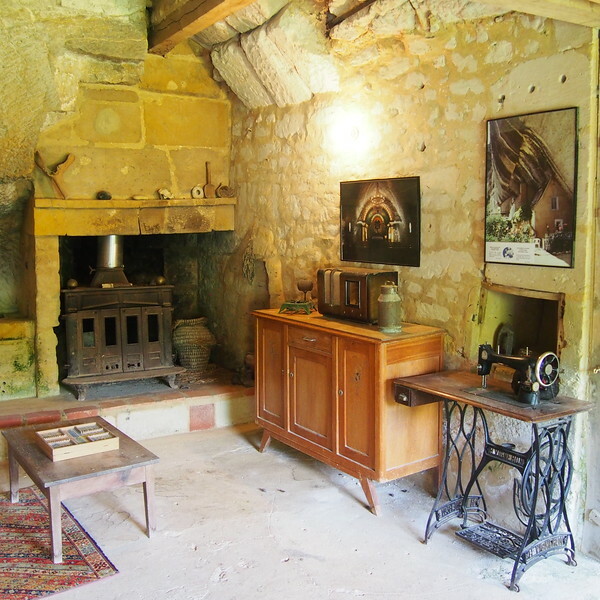 Living room inside Les Maisons Troglodytes. A couple of the rooms have had issues with damp and the walls are covered with green and black molds, this must be a constant battle in cave homes that have areas exposed to rain. The owners are working to fix all of these issues but it looks like a long process. Still, this place is worth a visit as it will give you a real idea about the realities and challenges of renovating an underground home. Beneath the church of St. Madeleine and St. Jean in Rochemenier. 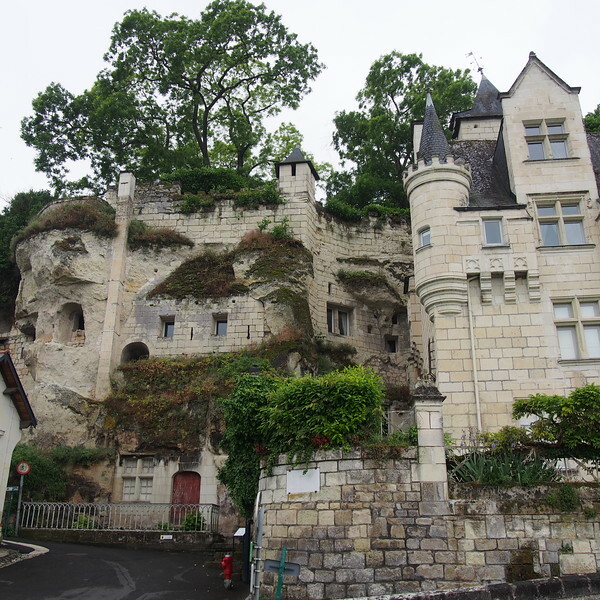 Next, we went to the Troglodyte village of Rochemenier. This village is only a 12 minute drive from Forges. The rooms on display here are in very good condition and are filled with some very interesting antique pieces of farming equipment. The underground rooms extend to the church across the road. But even here there was room closed off due to rain and there were still a few walls that had begun to sprout mold. It reminds me of the way we were always battling damp in our house in Ireland. Les Caves de la Genevraie restaurant in Rochemenier. 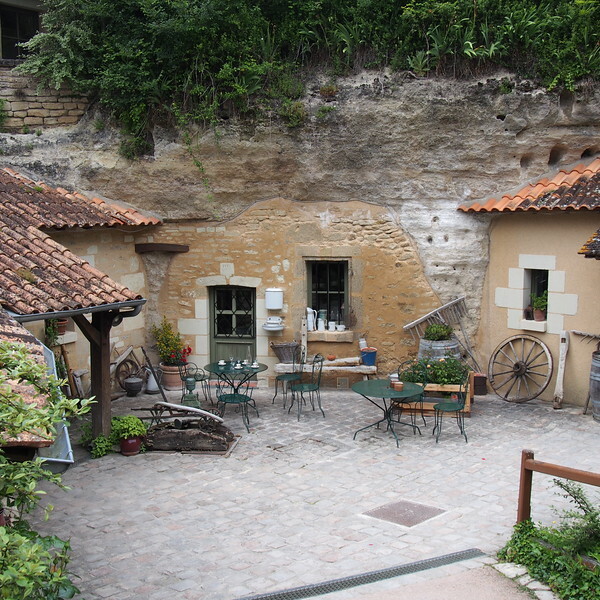 Outside of the main tourist attraction, there are two “troglo” restaurants in the village and a small cave hotel. By now, you might be wondering if all troglodyte homes are just damp farms carved out of the hillside. Au contraire, now I have something very different to show you. This lovely hillside chateau was the residence of Margaret dÁnjou, wife of King Henry VI of England. It is now a private home and not open to the public although you are free to walk around the nearby tunnels (they are well signposted). All the homes here were once linked by underground passageways so that Margaret and her court could travel between them without being exposed to the main street. One does wonder how many servants she had to employ to keep the damp at bay in such an estate. Directions: The best way to get here is to drive or bicycle down the D947 from the city of Saumur (about 7 km away). You can rent bicycles in Saumur. Caves Louis de Grenelle – Saumur is noted for its sparkling wines, including a sparkling red! A tour of the wine caves at Louis de Grenelle is only 2.50 euros and ends with a wine tasting of 3 varieties.